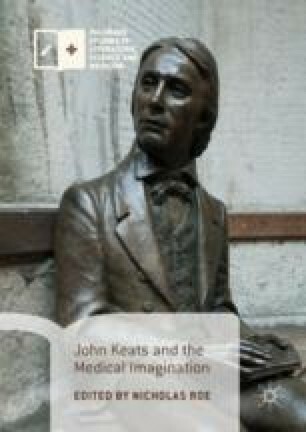 Throughout his writing, Keats evinces a double consciousness as a trained medical student, at the top of his class at the Borough Medical School, and as a poet concerned with states of perception. In both cases, he evinces an obsessive concern with the oxymoronic life of non-sensation. In his medical praxis, Keats was confronted with various stages of paralysis as well as what one of his teachers defined as apparent death. As a poet, Keats depicts an entire medical ward of paralytics in the fallen titans of Hyperion, and he begins a lifelong exploration of suspended animation as a mental state in ‘To My Brother George’ and ‘Sleep and Poetry’ in the 1817 volume. The reverie of those poems, however, is increasingly focused, in Endymion, the ‘Hyperion’ poems and ‘La Belle Dame‘, on psychological inanition. With the Odes, finally, Keats explores an oxymoronic universe in which life and death are conceptually intertwined, as they would have been throughout Keats's medical experience. I wish to thank Richard Sha who read an early and still sketchy version of this chapter and whose enlightened response helped me clarify a number of elements in its exposition.